2019: Fall date to be announced! A fun morning of precision shooting with hunting rifles and equipment from field positions at animal targets. 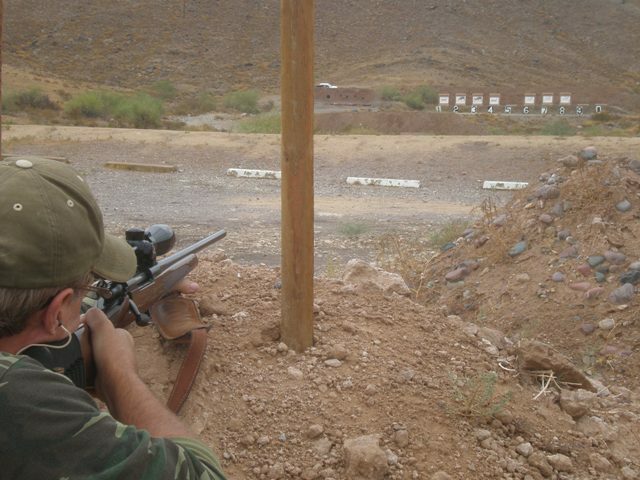 Any Hunting rifle(s) with hunting style scope – Make sure its zeroed for your hunting preference. 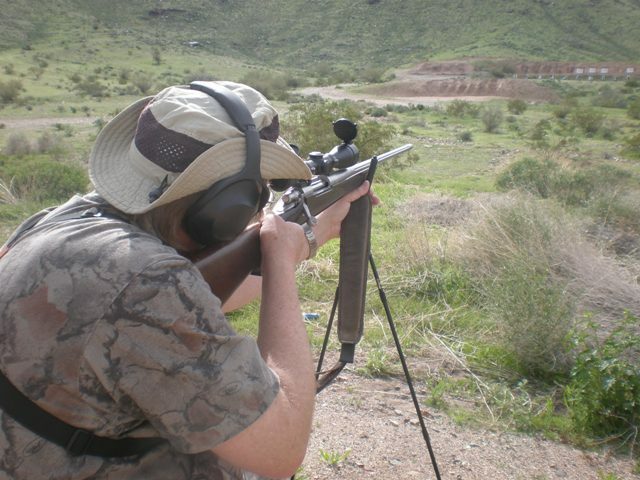 Different rifles are permitted: Deer, elk, varmit, predator etc for different stages , shooter's choice. Hunting equipment: bipods, sticks, backpack, binoculars etc (leave the shooting mats, NRA style coats/gloves and match, service or tactical rifles at home this trip). Dress as you would for a hunt in this weather. 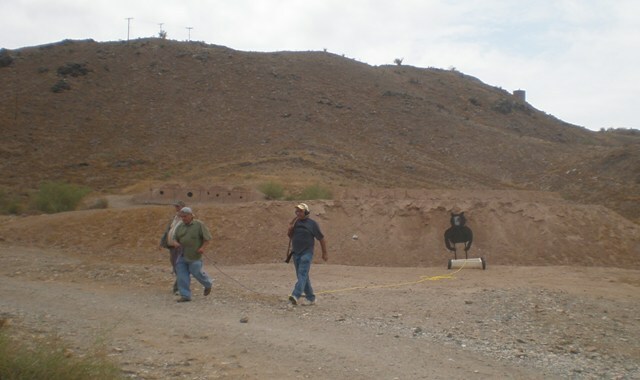 Multiple stages, details announced on shoot-day, mostly various animal targets may include shoot/don’t shoot scenarios. Reasonable hunting distances, out to hundreds of yards. Hit/Miss/Wound & shoot/no-shoot scoring, to judge your skills, but this is a fun shooting not a championships, no awards. Carefully aimed shots only. Participants will alternate shooting, scoring and marking targets. Bring Ear & Eye protection and WATER! 7:30AM start, 7:00AM set up. 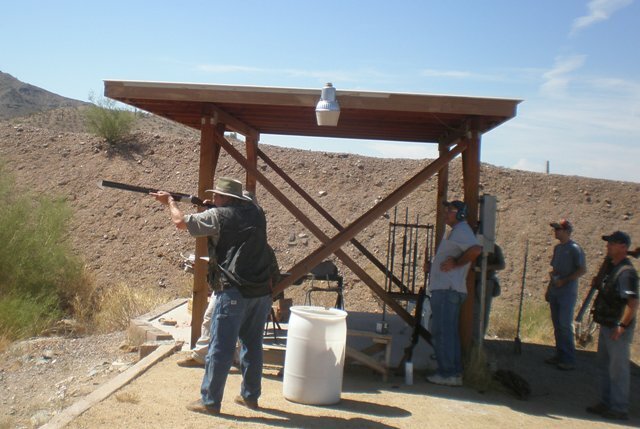 Fee $15, (discount for PRGC members), Limit 20 shooters, email Arizona@rifleshooting.org to pre-register or for questions. 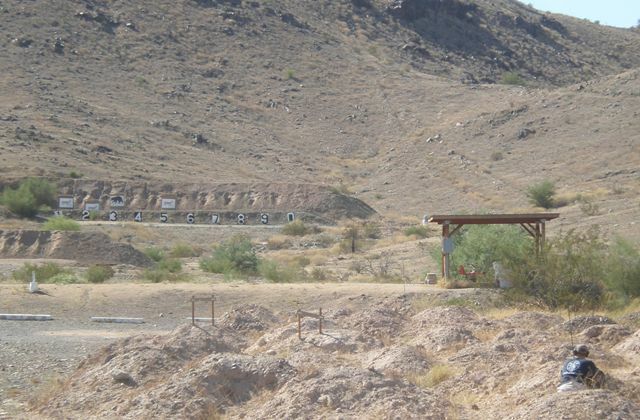 PRGC is a member-run club with 7 ranges from 10 meters to 500 yards. Take 7th AVENUE south of baseline to the base of South Mountain. due to light turnout, we did not keep score in the winter shoots. then went back to 400+ for whitetails and antelope, then a timed run & gun. Longest time was 7:24 so that was par, positive points for under par time. A couple of score sheets were not turned in. We started with a 100yd Elk shoot, went back as far as 350 yds for antelope, shot deer and bear and ended up with coyote's from some awkward shooting positions. that first stage was reduced elk at 100yds, every one of us got 5 heart shots. 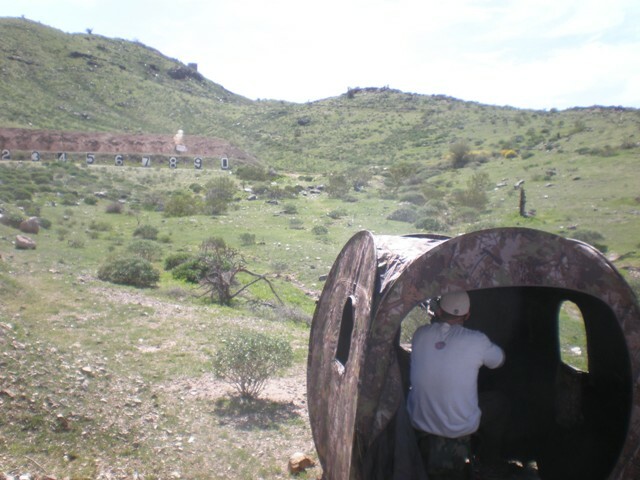 Then Whitetail at 200, then Javelina standing at 100, then a run-n-gun, then 500yd 'lope. so we shot a 3-shot group at 100 yds and scored it distance to center for each shot. the rest was like usual. With the new irrigation ditch in the pits we can no longer do the walking coyote shoot. 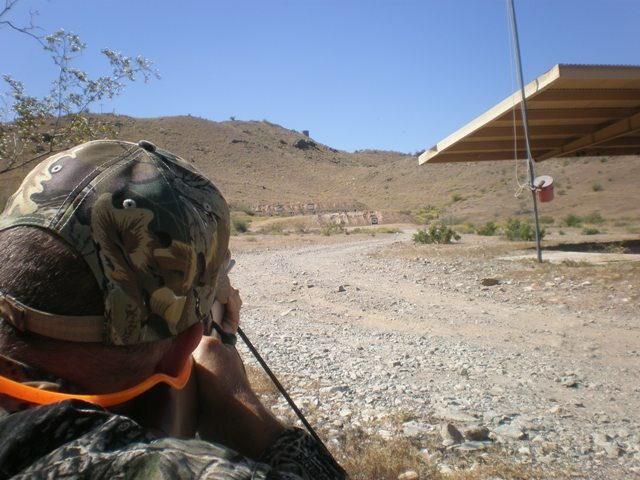 23-Jan 2011: We had 4 stages, Antelope at 400+ then 300 yds, then a run & gun with deer, bear, 1/2 size elk and a walking whitetail. Then limited-time at deer at 200 yds, then the walking coyote stage. 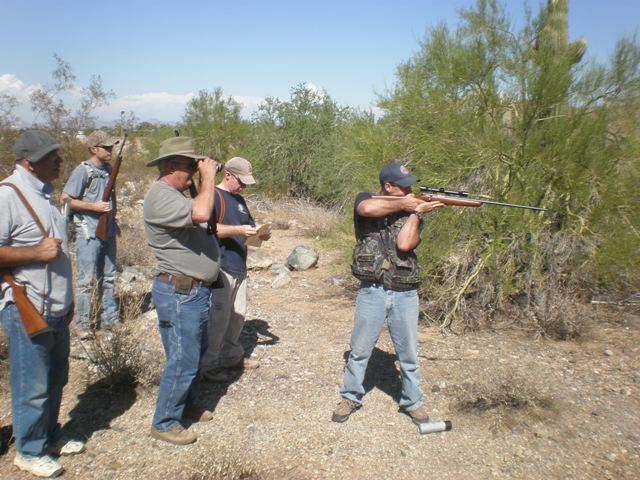 afterwards some of us shot handgun javelina from 25 to 100 yds. 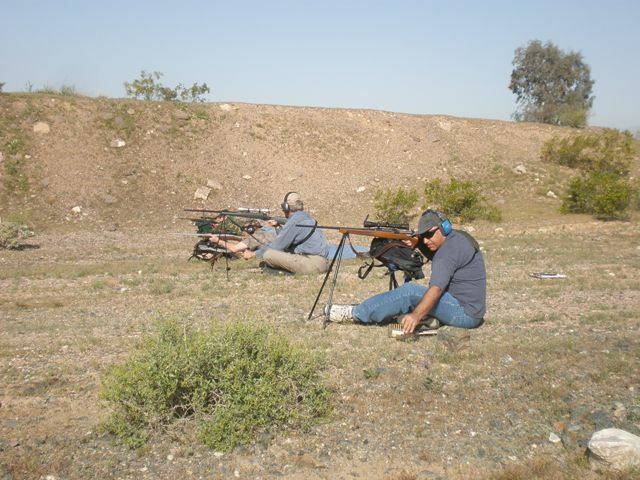 2 guys showed up to watch and help coach but didn't bring guns to shoot, I hope they come back next month with rifles. One guy didn't keep score! and a shotgun too for the bird hunting! The Charging Bear is ready! You're coming back from a long day hunting or fishing. You're either carrying a rifle, empty chamber, slung over the shoulder, or a fishing pole, loaded bear revolver holstered. you've got your non-hunting companion with you and a highly skilled guide, attuned to all the sounds and noises of the woods, excellent eyesight and ability to spot and identify game of all species. While your non-hunting companion is paralized with fear, you must unshoulder your rifle, chamber a round and shoot the bear in the vitals with enough lead to top a real bear. Or, with your fishing pole in your hand or dropped to the ground (its a $3000 Orvis split bamboo with a Pate reel) draw your revolver (at this point, non-hunting companion is really your RO observing that you don't point the revolver or rifle in an unsafe direction, like at him). and shoot the bear in the vitals with enough lead to stop a real bear. Non hunting companion, aka RO, must put his foot out and stop the bear buggy before it crashes into the guy with the loaded gun! 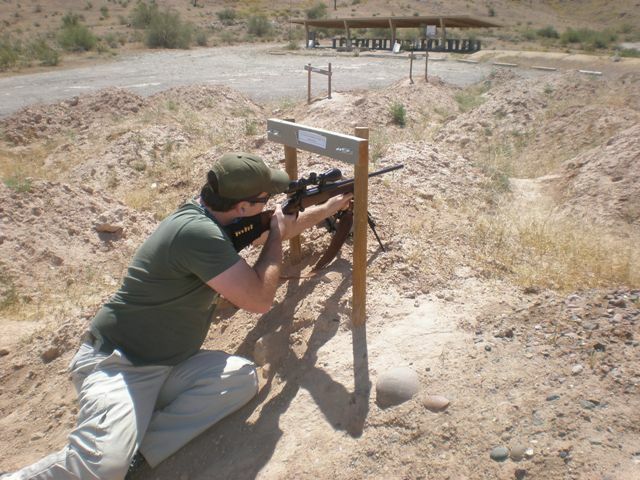 We'll do this on high power in front of the 100 yd impact or maybe in a practical bay. how much lead does it take to stop a paper bear? we'll figure out a scoring system. Maybe +20 points for killing the bear, -100 points if you get eaten. I did not get a card turned in from Roberto! but here is everyone else's score. I will try to put pics on my website & AZS in a bit. We shot 300 & 400 yd antelope, an assortment of deer from the mounds against the clock and as a bonus shot at the charging bear. Being a good conservative bear, he kept veering to his right, I'll have to re-design the bear buggy before next shoot. 2 guys left early and weather looked scary so we skipped the paper prairie poodles. we finished up, put the bear back in my truck and right about then the rain started coming down, I mean it POURED!!!!! it was blocking traffic with 8" deep flooding on baseline.... got to north scottsdale it had been dry all day! So I added up the deer/'lope scores including time with a 120 sec par time and get these scores. 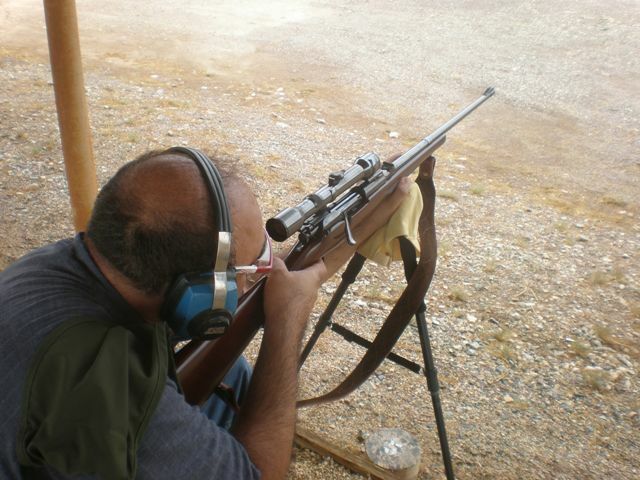 "I learned I don't know my hunting rifle very well!" No awards, the score is just to make it interesting, this is not a "competition" it is a training technique. but I did change around the scoring technique so the numbers come out more positive. 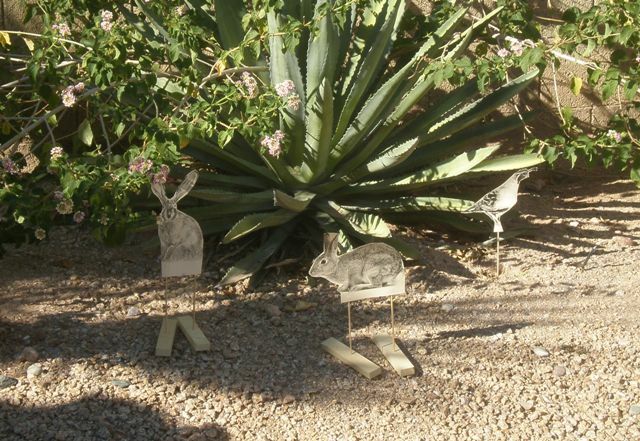 and ever favorite coyote walk, with a Javelina thrown in for good measure. 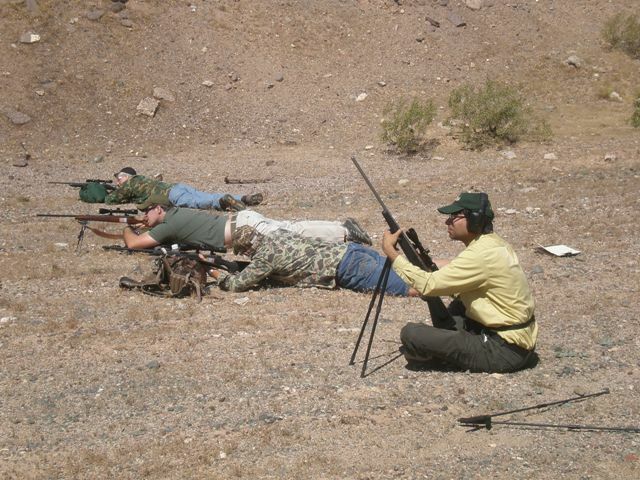 This time we interspersed don't shoot targets, such as a hunter or other species. You even get penalized if you scope the hunter or shoot while he's present. Well, that was fun, but a long day. Last time (oct-09) it seemed like four 5-shot stages was too little, so I increased the round count, I also imposed tighter time limits, but the day still took longer than last time. 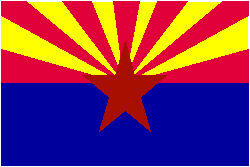 We had 6 shooters, including 2 visiting relatives, experienced hunters from Colorado. 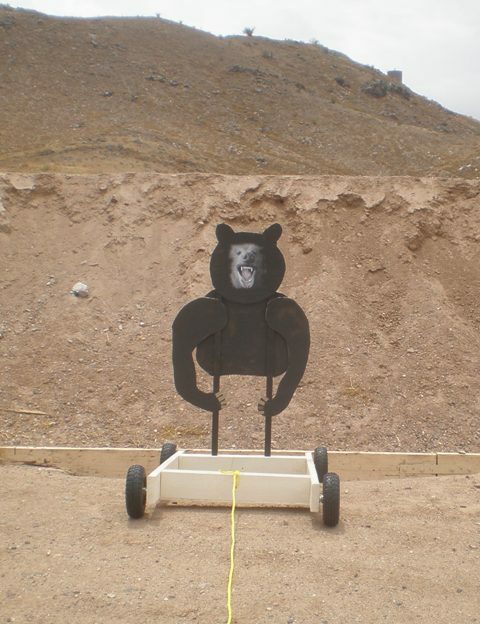 First stage, 3 shots each at 414, ~350 and 300 yds, slow fire any position at antelopes. The ~350 yd stage had a barricade emulating high grass so prone could not be used. Second stage was various distances between 280 and 210 yards. Some were 2 shots in 30 seconds some 1 shot in 20 seconds, where the shooter had to move into position, set up and fire in the time limit. 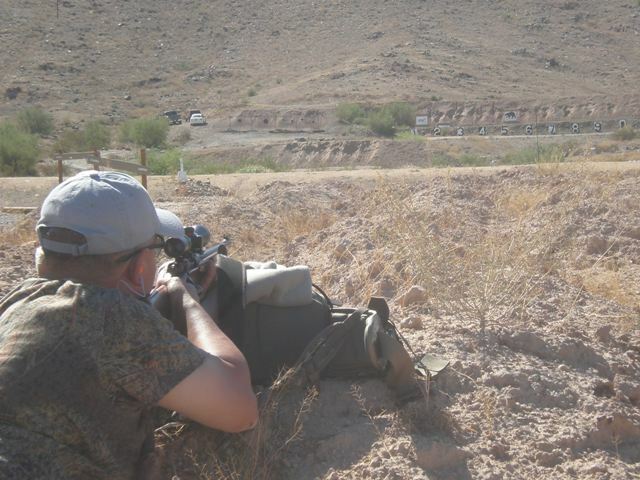 Targets were deer, antelope and bear. Third stage was Coyotes. 10 shots at 100 yds, coyote’s “walking”, while sitting in a ground blind with the caller howling. Fourth stage was a Know your Limits, up to 5 shots at 100 yds any position, at progressively smaller but higher scoring targets with all points lost if you fire a miss. Fifth stage was a sudden elimination offhand shoot at 200 yd gong with progressively higher score per hit and elimination at the first miss. One shooter fired 5 shots, missing only the last. The animal targets used a hit/miss/wound/decline scoring formula that heavily penalizes a wound. 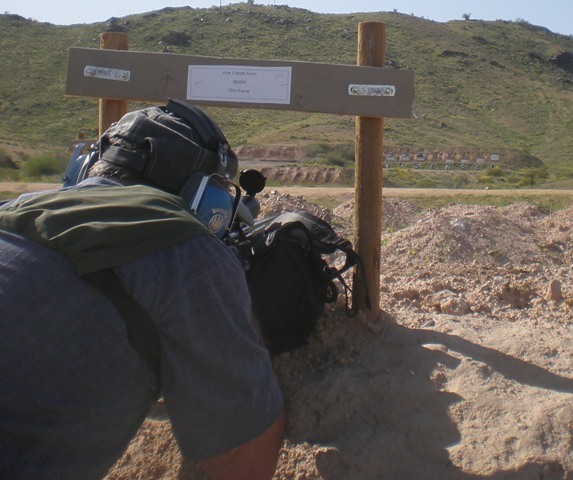 With miss or wound carrying negative points, NO SHOOTER HAD A POSITIVE SCORE! 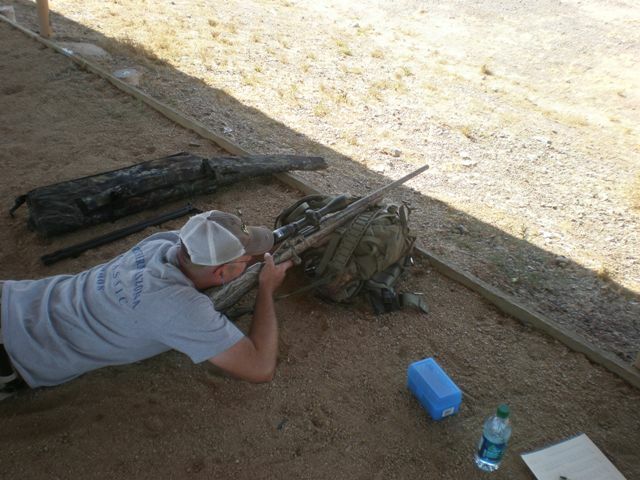 Rifles ranged from .22-250, .270, 300 WM, .30-06 and one shooter used a .375 H&H for some stages and .17 HMR for others. I’ll get the pics up in a bit. 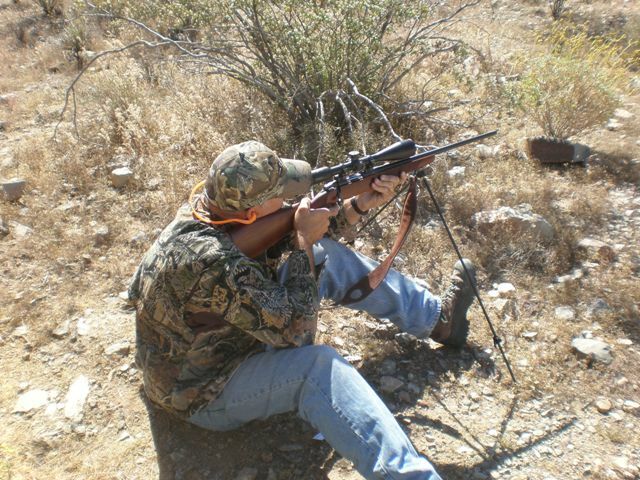 Note all targets were game animals (bear, mule & white tail deer & doe, pronghorn antelope, coyote & javelina). The kill zone was out lined in the target but wasn't visible to the shooter from distance. Stage 1 had you fire 3 shots from the 300 and 2 shots frm 414 yds on a life size antelope target. 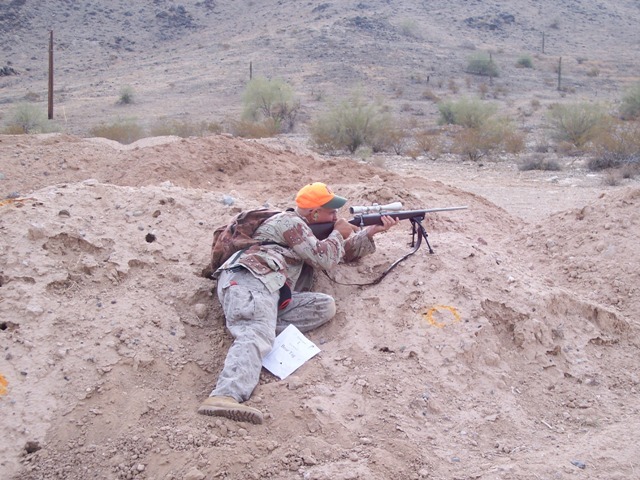 All shots were from prone position with artificial support - if you brought it. Shot count : 5 rds. 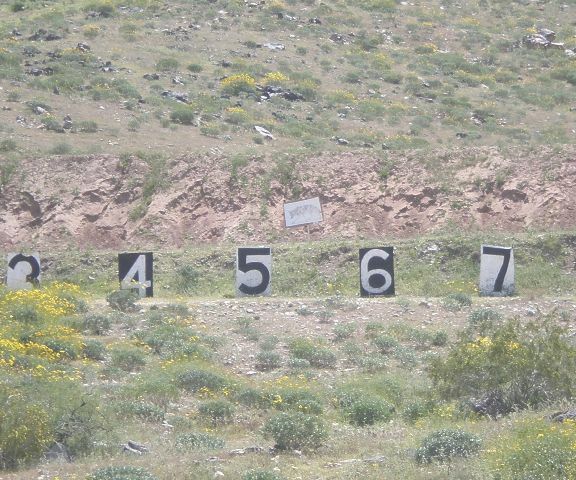 Stage 2 was 1 shot each from 5 positions between 200-300 yds on a specific target. 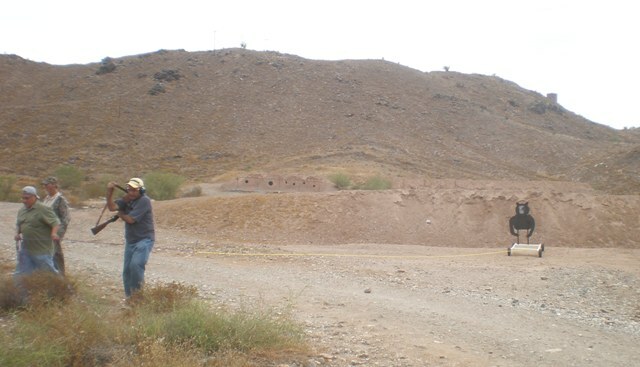 These stations required a field expedient position and the use of shooting aids if you had them. 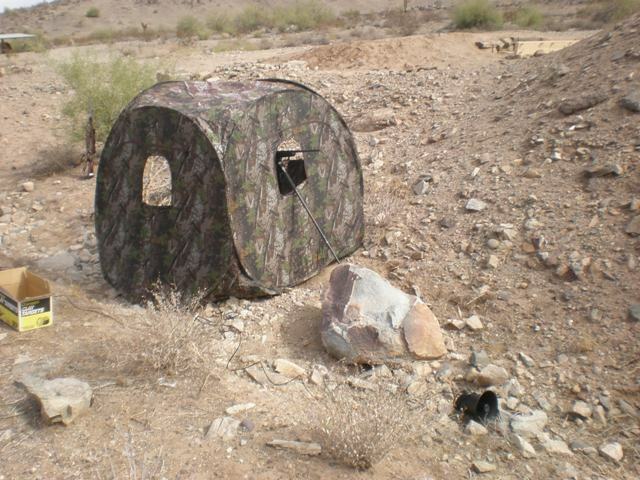 A blind was set up with an electronic call . 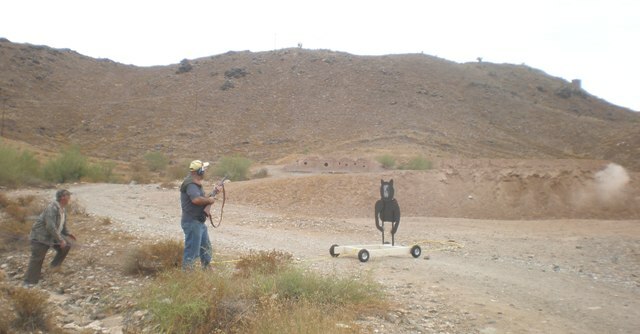 Five coyote targets were placed on the frames,along with the other species. (bear, antelope, deer). 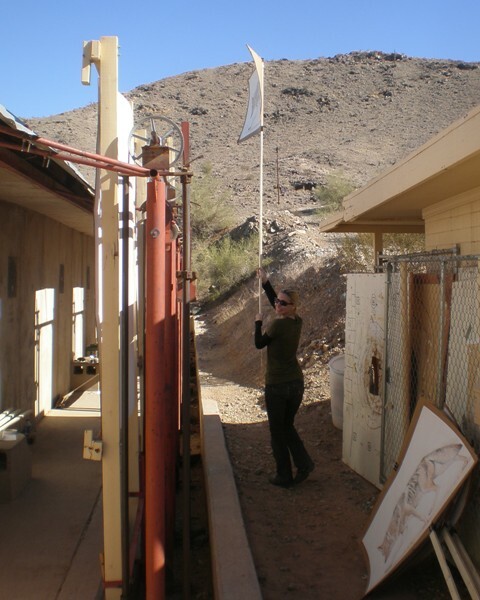 Once the call commenced , the targets were raised and lowered at random until each Coyote was shot. 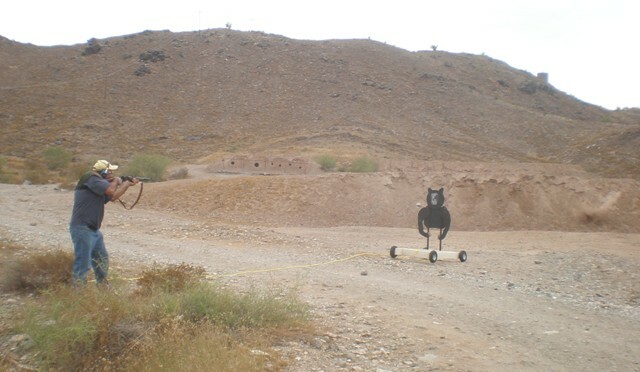 Javelina targets were placed on the 100 yd berm. we started at the 100 yd line and shot 1 rd (standing to kneeling or sitting). 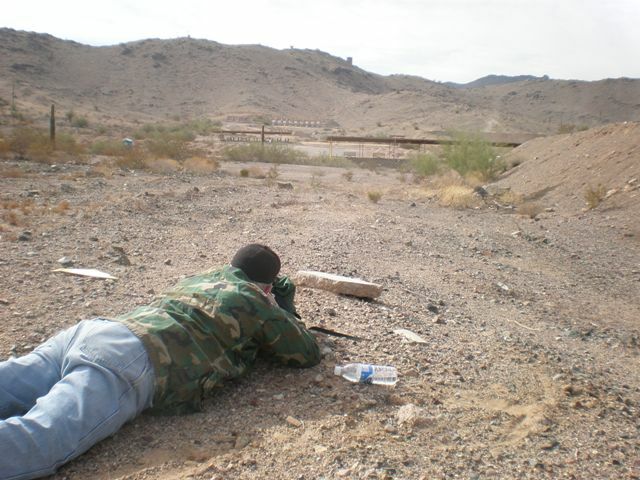 We then moved as a group to the 75 and shot 1 rd kneeling. Up to the 50 for 1 rd standing and finally to the 25 for a double tap. 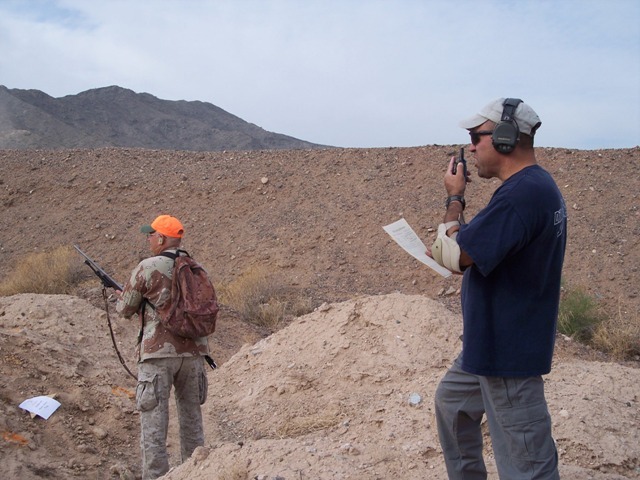 In the course of a morning the participant practiced possible field positions from 25 to 400+ yds on realistic targets and distances. The match fee was reasonable, especially when you consider the cost & number of the life size targets. Only needed to run 1 box of ammo and some guys ran reloads. This was the first time for my 223 bolt gun past 200 yds and using a dope sheet calculated online, I was satisfied with the results. Shooting sticks & tripods are not gay and should be carried & used in the field, along with bipods,packs,etc. I used my pack for the 300+ shots but didn't have sticks or 'pod for Stage 2. 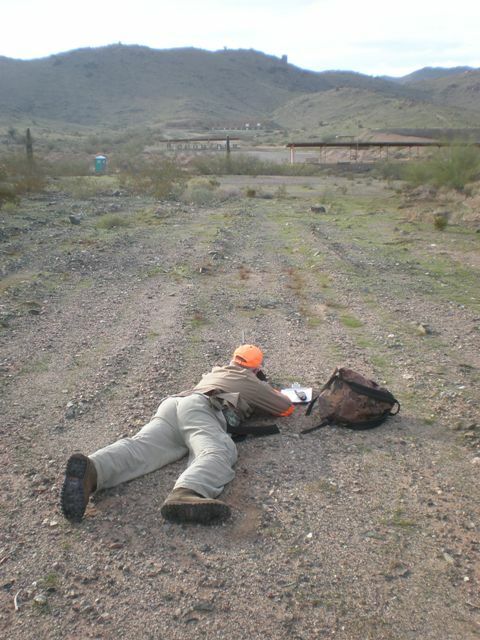 If you think your brl might not clear the dirt when shooting prone on a slanted position, it probably won't. 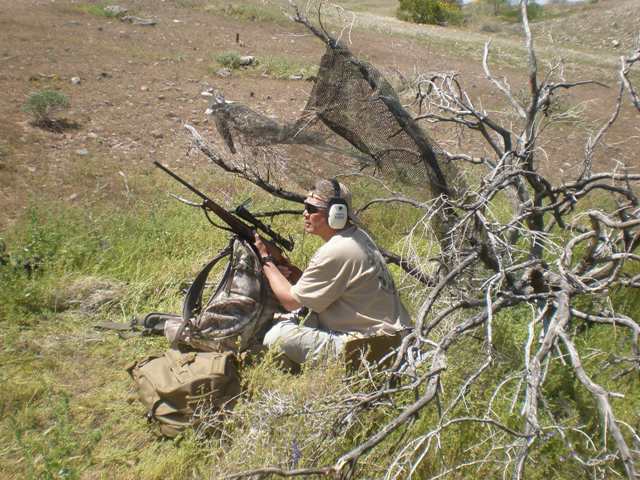 A 1moa rifle is perfectly fine for hunting, especially shooting Minute-of-Bear vital zone. The coyote call is the most annoying sound ever, more so than a misplaced Bostonian in the land-of-the-free. Rushing a shot could result in a miss here but a wounded animal in the field, take the time you need. For a first time effort, I think it went well. Everyone looked like they enjoyed it and learned something about themselves and their equipment. I hope to see more of these type of matches in the future. 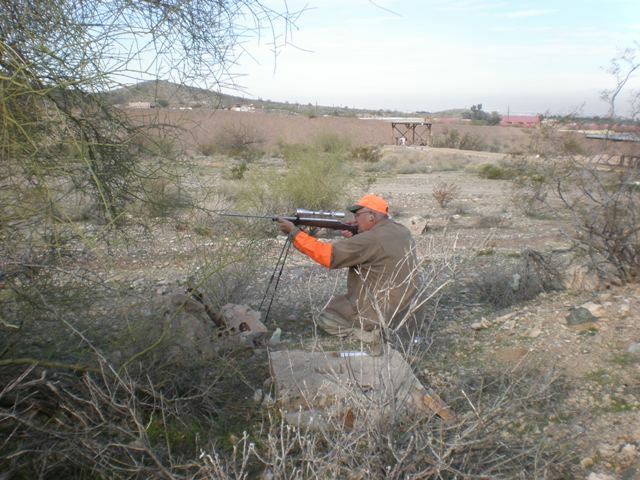 Any Hunting rifle(s) with hunting style scope – Make sure its zeroed for your hunting preference. 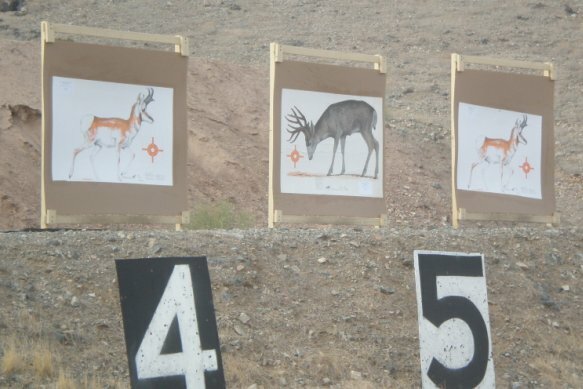 Different rifles: Deer, elk, varmit, predator etc for different stages if you like. Dress as you would for a hunt in this weather. (it will be warm and there is very little shade). Carefully aimed shots only. Participants will alternate shooting, scoring and marking targets. Bring Ear & Eye protection and WATER! 7AM start, 6:30AM set up. Now to be a regular event at PRGC. 2011 schedule to be announced! last modified by Bill Poole on 15-Apr-19, 5-apr-19, 31-Dec-18, 2-Feb-18, 4-Feb-17, 13-Dec-16, 12-Nov-16, 2-Mar-16, 28-feb-16, 2-Jan-16, 31-May-15, 23-May-15, 11-oct-14, 28-Sep-14, 1-Apr-14, 25-Feb-14, 29-Sep-13, 6-May-13, 30-Mar-13, 27-Mar-13, 31-Dec-12, 28-Dec-12, 23-Sep-12, 13-Aug-12, 7-Apr-12, 5-mar-12, 12-Feb-12, 24-jan-12, 23-Jan-12, 15-Dec-11,19-May-11, 20-Apr-11, 20-mar-11, 2-mar-11, 24-jan-11, 26-Dec-10, 16-Dec-10, 1-nov-10, 14-oct-10, 27-sep-10, 1-Aug-10, 27-Jul-10, 7-Jul-10, 22-Jun-10, 1-May-10, 4-Apr-10, 7-mar-10, 7-Feb-10, 3-jan-10, 30-Nov-09, 1-Sep-09, ©.